Looking for a custom gift? Our Gift Boxes are perfect for any holiday, birthday, or special occasion. 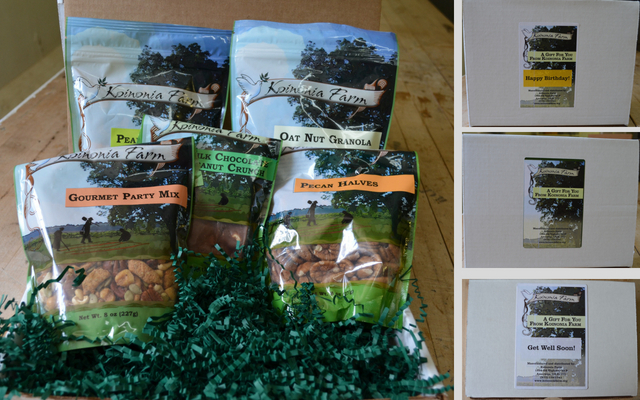 Choose a box with 3, 5, or 7 of your Koinonia Farm favorites. Each box is packed with recycled crinkle paper and you can include a personal note for your loved one. You can also choose the message on the front of the gift box- "Happy Birthday!" "Happy Anniversary!" and more. Be the first to see special offers and other updates. Welcome to our new online store! If you had an account at our old store, simply click “Reset Password.” Follow the steps to reset your password (you can still use your password from the old store). If you had an account at our old store, simply click "Reset Password" on the left, and follow the steps to set a password for your new account! 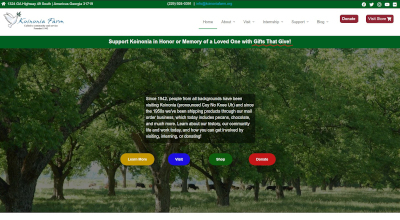 Don’t hesitate to contact us with any questions by email (products@koinoniafarm.org) or by phone (229-924-0391) during business hours. If you had an account with us at our old online store, simply enter your email address and follow the steps to reset your password. You can even use your previous password from the old store. Once you have reset your password by clicking on the link sent to your email, you new account will be set up with your billing and shipping address and you’ll be all set with your new web store account!